SKATE FREDERICK’S SUMMER 4 WEEK CLASSES! All classes will be held on Wednesday evenings. All Weekday Morning and Saturday classes resume in September. Group Lesson Program where ice skating lessons are offered year-round at our dual rink facility. Stemming from the rebrand of the Basic Skills Program, Learn to Skate USA offers an abundance of enhancements tailored toward improving the experience for parents and skaters. Learn to Skate USA is the only ice skating program endorsed by U.S. Figure Skating, USA Hockey, US Speedskating and the Special Olympics. Learn to Skate USA offers every participant a rewarding experience rooted in the lifelong benefits of ice skating. The Lessons learned in ice skating are lessons in life. The confidence and joy you see your kids gain today will become the greatness your kids achieve in the world tomorrow. Make-up classes are not available during the Summer months. Ice skating is a great way to exercise and have fun at the same time! 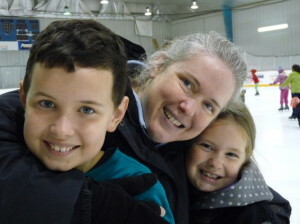 Our group skating lessons offer children and adults of all ages and abilities the best way to learn the fundamentals of ice skating. In person at the Pro Zone at Skate Frederick. Phone, please call (301) 662-7362. Credit card payment is required for registration. Fax, please send to (301) 662-7361 with credit card information. All Fall, Winter and Spring Learn to Skate group classes are held in an 8-week format on Wednesday evenings and Saturday mornings unless otherwise specified. The Summer Learn to Skate group lessons are in a 4-week format and are held on Wednesday evenings only. Mastering all of the required skills for a particular level can be challenging in a 4-week session. It’s very common for skaters to repeat a level taken during the Summer Mini Sessions. However, if the skill level is successfully completed the skater will graduate to the next level at any given time during the session. Pre-registration is required for all classes. Classes fill quickly! Figure skates-for the first time skater, these are easier to learn in because the long, flat blade provides more stability. If playing hockey is your goal, the switch to hockey skates may be made after a time of success with figure skates. Please consult your instructor. Skaters should arrive 10-15 minutes prior to the start of class. Pick up skates (know your tennis shoe size) and name tag at Skate Rental. Instructors will give skaters their welcome packets. Questions? Contact Kelly Orndorff, Skating Director, at k.orndorff@comcast.net or 301-662-7362 ext. 16.